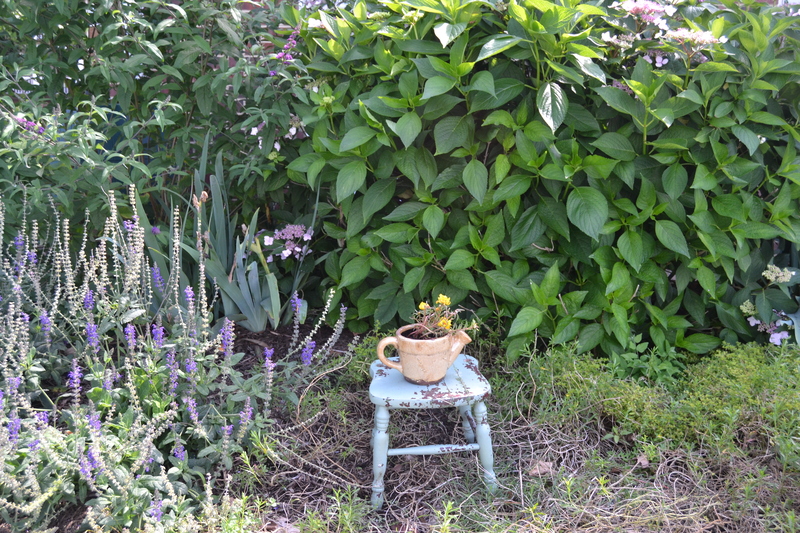 Whenever I’m in antique or thrift shops, I’m always on the look-out for little wooden stools and childrens’ chairs to use in my flower beds. 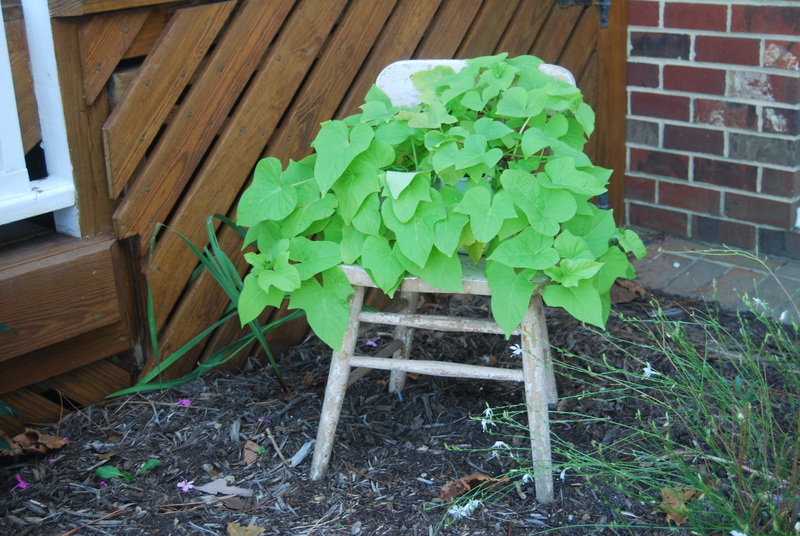 For example, I placed a potted sweet potato vine on this little chair last year. Early one morning last week, I was out in the yard, filling bird baths and feeders and just checking on things in general, and I saw this. And it stopped me in my tracks. One of my little chairs, broken into several pieces. 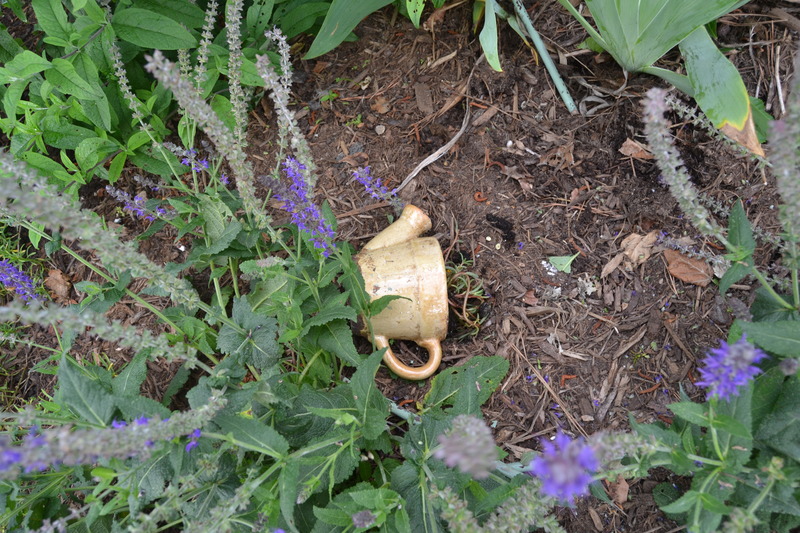 It was originally in the flowerbed, just to the left of that yellow blooming plant. I must admit that it frightened me at first. For one thing, this happened right in front of our bedroom. (Those are our bedroom windows you can see in the background.) Who – or what – would break that little chair? And why? This was the flowerpot that had been on the chair. I began gathering up all the parts, still in disbelief. Deer hoof prints. Well, that explains what did the damage. But the question “why” still remained. Then, I did what I normally do when something needs to be repaired (at least portable things): I put all the parts in a box and took them to Motor Man at our shop. And, after several days of trying to fit them all back together, we were left with yet another question. Why would the pieces of the back section not fit correctly like they did before? With no answer to that question, I now have a wooden stool. I’m still wondering what that innocent little chair did to infuriate that (or those)deer? 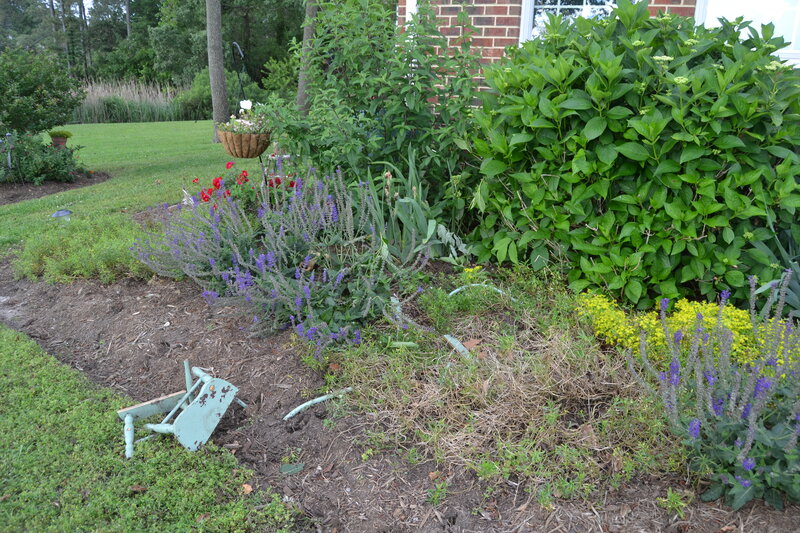 This entry was posted in Days at Home and tagged deer damage, flower bed, portulaca, sweet potato vine, wooden child's chair, wooden stool. Bookmark the permalink. A mystery indeed. 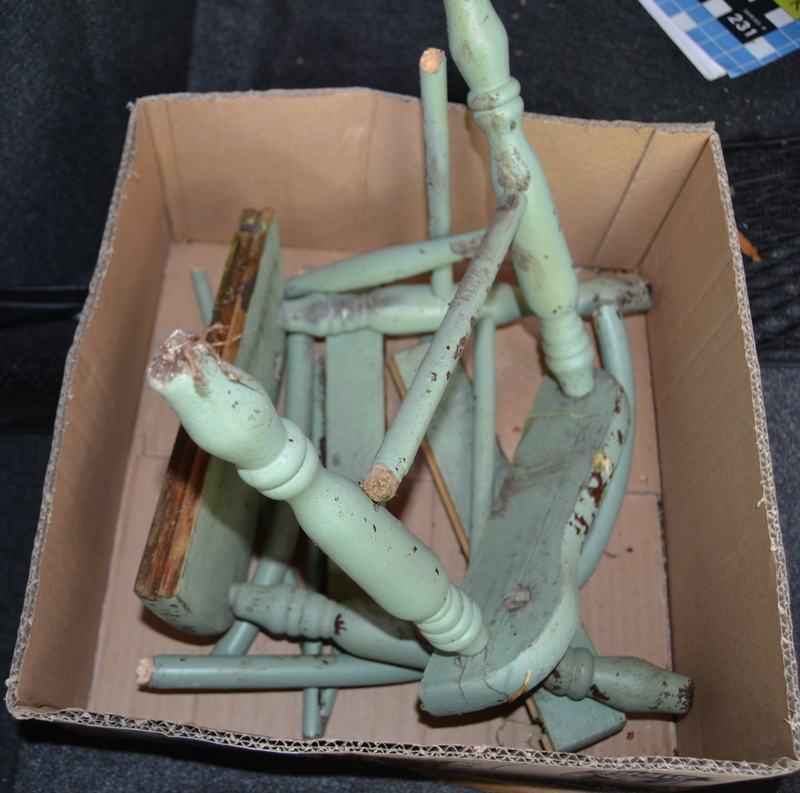 Even if the old chair rotted it wouldn’t just collapse in a heap of parts – perhaps the deer found that potted plant irresistible and in having a nibble it accidently broke the chair……at least MM salvaged the parts and made a stool for you – let’s hope the deer leave THAT alone! Pam, a reader commented that I should write a children’s book: “The Mystery Of The Little Chair”; I told her I would definitely need YOUR help! That deer must have really been mad….maybe he/she didn’t like the plant and decided to take it out on the poor little chair! Good thing you weren’t out there!! OH, DON’T GET ME GOING THIS EARLY IN THE MORNING ABOUT DEER! THEY HAVE DONE SO MUCH DAMAGE IN OUR YARD! THAT IS SUCH A STRANGE THING THOUGH TO FIND YOUR CHAIR IN THAT SITUATION, ALL BROKEN UP LIKE THAT! I MEAN WHAT THE HELL WERE THE DEER DOING? WERE THEY DANCING ON IT? OR WERE THEY STANDING ON IT TO TRY TO REACH SOMETHING AND IT BROKE? OR PERHAPS, THE DEER WAS TIRED AND SAT DOWN. EITHER WAY, IT IS A SHAME THAT THE CHAIR WAS BROKEN. 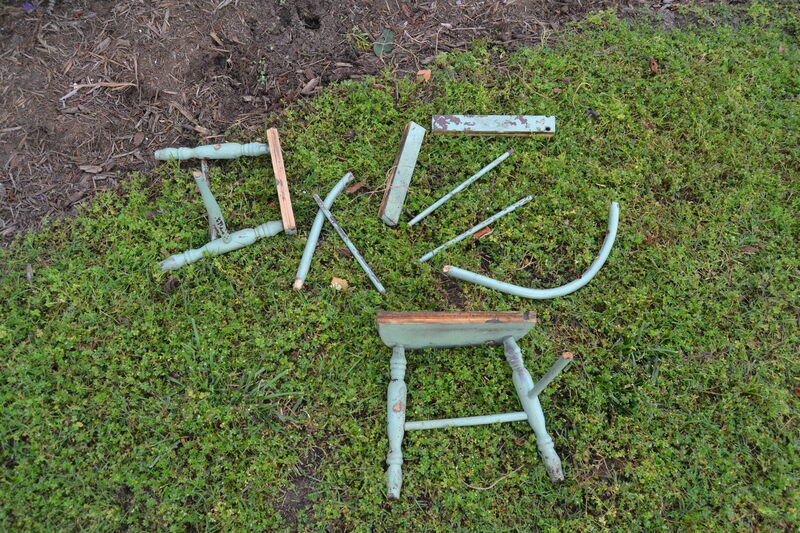 RIP LITTLE CHAIR IN THE GARDEN. I AGREE! I TRULY WONDER WHAT IN THE HECK THEY DID TO BREAK THE CHAIR. I have to admit that I gasped when I saw the chair in shambles; I am relieved to know it was deer and not someone creeping around your house doing damage just to damage! That was my first thought, MJ! 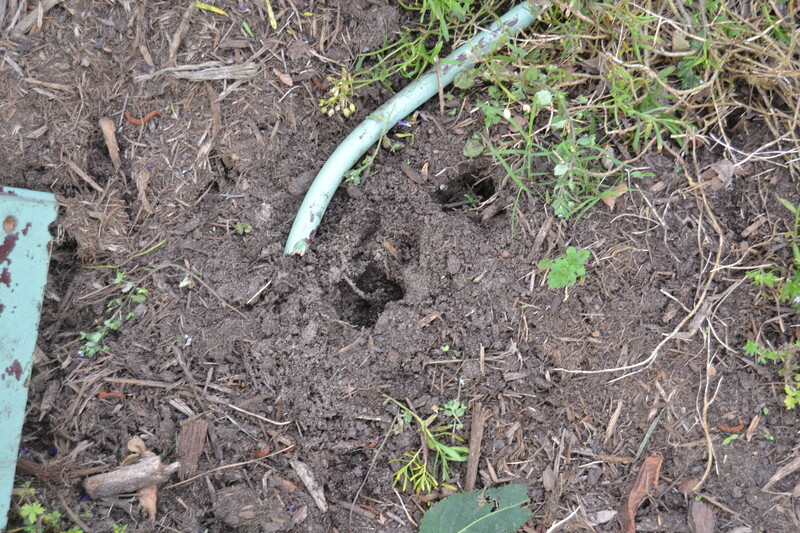 Deer are not so dear when it comes to reeking havoc in the garden. I feel your pain. In my mind, I imagined that the deer got the little chair caught on its hoof like some sort of “tiny” chair “high heel”. One step and the little chair was…… well……. a nice little stool! Motor Man to the rescue. The mystery was resolved but poor chair. Deer are amazing and unpredictable. We had problems with them. I took a video one day of one eating our green beans. So that very day we put up pinwheels and wind socks in our gardens and so far they’ve kept the deer away. We like the cheerfulness of the pinwheels/windsocks and so far they’ve been a natural deterrent for deer and birds. I thought about Goldilocks, too, E.C. AFTER I published this post! No answers to your questions Dianna but I think it is darling sitting there as a stool! Perfect for the little flowerpot. Thanks, Pix. Hopefully the deer will leave it alone now! I bet the deer was as frightened as you by the broken chair. I can almost picture it happily nibbling on the greenery when it suddenly collapsed and crashed to the ground..
Yea, I wondered if the deer tried to SIT in the chair…?? How awful! I also gasped! The little chair was so cute! But at least Motor Man was able to restore the seat and legs to make a cute stool. i thought deer right away. testing out new grown antlers against the rails, i’m guessing. I am with you… what made the deer attack that sweet little chair? We’ll never know. But, it made an adorable stool. I like it. Poor garden-chair … Just in the wrong place at the wrong time … Such a strange mystery – let us know if you uncover any more details ! Yah, that’s just weird. Maybe the deer was trying to use it as a scratching post and got carried away? Glad that cute tea post didn’t get busted up! p.s. you’ve got such a pretty yard! Thanks, Dee! It’s a lot of work, but I enjoy being outside so much more than being indoors! If I had horses, I’d NEVER come inside! I’m constantly spraying Liquid Fence (or as my son calls it: “Liquid Stench”). It does keep them from eating my plants – as long as I remember to reapply it often, especially after a rain. This is when a wildlife cam could come in handy :-). So true. We may have to invest in one! The little bench that was once a chair is very cute. Don’t you feel a children’s book coming on? The Mystery of the Little Chair, by Dianna. I’d have to get my blogging friend/author, Pam (www.onespoiledcat.com) to help me with it, Dor! Well, my first thought was Goldilocks came along, plunked herself down in that little wee chair and promptly smashed it. Then because the black bear are roaming my neck of the woods again, I thought maybe it was a bear that sat in the chair instead of Goldie! Ha. But those pesky deer, while cute as can be, can certainly trash things too. Deer have just about annihilated our lilac bush, so why not a chair? A bear was spotted in our area last summer, so it isn’t impossible. But once I saw the deer hoof print, I figured I had solved that part of the mystery at least. “Why” will probably never be answered.. I wouldn’t have thought deer could totally dismantle the chair. Maybe Theresa is onto something…puzzling that it would’t go back together. I just can’t imagine unless the deer got his leg caught in the chair. And usually Motor Man can fix ANYTHING; it really was strange that the back of the chair wouldn’t fit back on it correctly…!